In pursuit of providing neurosurgical education and hands-on training to young neurosurgeons, the AMSRS organized a Comprehensive Skull Base Course (CSBC) in the months of February and March 2019, under the directorship of Dr. Iype Cherian. This course utilized the online teaching platform and delivered state-of-the-art lectures covering anterior and lateral skull base, the internal carotid, as well as endoscopic approaches to the skull base were discussed in detail. A special lecture was also put to discuss the proper use and safety of endoscope in skull base surgeries. The online lectures were conducted weekly and televised live on Neurosurgical TV, with an impressive participation from many young neurosurgeons and residents around the world. The last two lectures were purely interactive with open discussions on trauma and cerebrovascular cases. Following the lecture series, a three-day hands-on cadaveric skull base workshop was organized at the Institute of Neurosciences, Nobel Medical College and Teaching Hospital, Nepal, under the directorship of Dr. Iype Cherian. Participants from South America, United Arab Emirates, Zimbabwe and Russia were engaged in a rigorous hands-on training for anterolateral approaches and even complex dissections involving the trans-labrynthine approach. During the workshop, the participants also observed live surgeries and oriented themselves with the use of a full navigable microscope, and an intra-operative MRI facility in a neurosurgical suite. 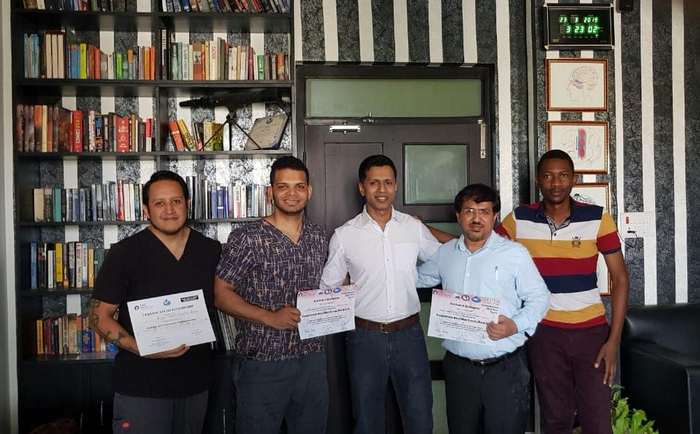 Certificates endorsed by the World Federation of Neurosurgical Societies (WFNS) and the Asian Congress of Neurological Surgeons (ACNS) were distributed to participants, and they enjoyed the local hospitality provided during their stay in Nepal. The AMSRS will continue to organize such courses and provide accessible and affordable opportunities for training of young neurosurgeons and residents around the world. We sincerely thank our faculty, Dr. Vinod Felix, Dr. Sampath Chandra Prasad and Mr. Sunil Verma for their time and contributions. In order to provide a handy tool for skull base learning, the proceedings of the lectures from the CSBC are in the process of compilation and will be available as an open source online. I would like to sincerely thank all the participants for making this course a huge success.